how to make tabbed sub-sections? I was wondering how to make this? Mainly it's like the tabs of chrome and firefox. So anyone know how to do this? Re: how to make tabbed sub-sections? Did you see this on some forum or just your idea? xKillerZone31 wrote: Did you see this on some forum or just your idea? See it on http://www.avacweb.com. Why? Paste the following and hit submit. 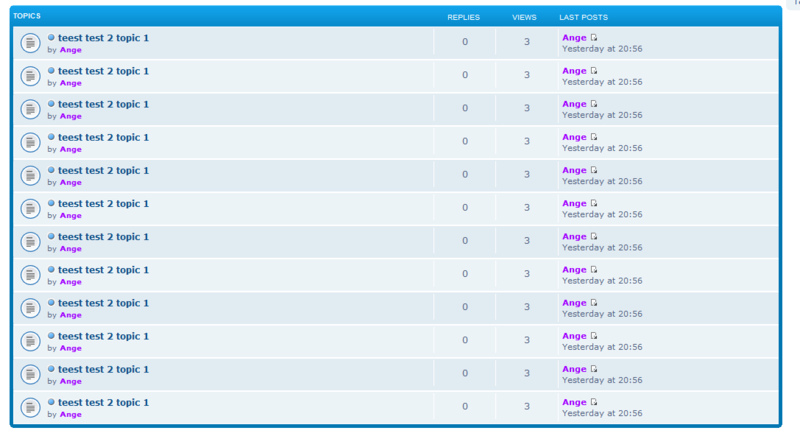 @SethC1995: it work on the main index of the forum but what should I modify so it will work for the sub-sections? Instead of the subforums being displayed in separate tables they're displayed in one table which could make this difficult to modify, considering that most of the classes are shared by the topics in the sub forum. I see, I tried to add your code to sub-forums but it just like a title showing up what category they are in. So in a way sub-category forum have different structure than the main index forum? Then I hope a way to make this work in sub-categories will come up. You're correct! The structure is much different, hence I will be studying to see if I can come up with a solution. If I do, I will post it here. As for your other question you can do much to modify the index. Firstly you must make sure that your script only runs in the index(or homepage) when creating a new script. If I use this and tick 'In the homepage' it will make only the index have a gray background or "wrap". of course for testing and grabbing the correct selectors you should consider using a browser with devtools like firefox or chrome. Then how about CSS? I think I need a class name or something to modify it appearance. ('SELECTOR') - Your selector, say an element without a unique class name. Thanks SethC1995 for the info. Now I just need to wait if you find something out for the sub-sections. After studying it I finally figured out what I needed to do. The dl.icons move a bit, but it seems to work better than I expected. Paste code below, save, and you should be good! Just realized a little mistake I made while editing, turns out you will need a liiiittle bit of CSS, but none of the same. Cool, as always nice work SethC1995. Thanks for the help really appreciate it. EDIT: Sorry to trouble but I forgot to mention that the content of the section is shown. Is that possible? You're speaking of the topics in the sub forums, yes? If so, what is it you wanted to do with them? Yes, in the current script you made the table type section is still there mainly we still need to click it view its content so changing it to tab type I just need to click the tab and content of that sub-section is shown. I have to target a specific subforum, then load its threads. The greater problem is incorporating this into the script. So what you're currently unto is how to make the topic show while removing the table type sub-section? Do you mean those sublinks? Scroll to bottom and find 'Sub-level links on index', tick 'non', and save. 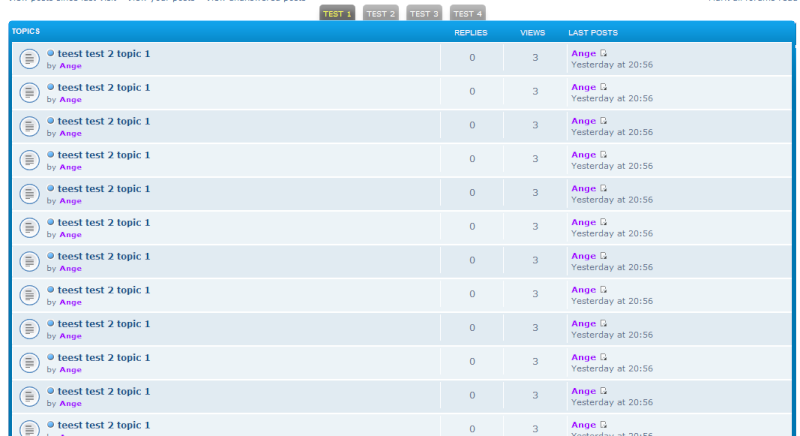 On top of that I can't seem to get the other threads to appear, only one thread a buncha times. As I said I might not be able to help with doing that at the moment, apologies. Something like this one (edited only) Clicking the next tab will show that section. Well, I've did some studying on load and made some progress. Clicking any of the tabs will fetch the contents from /f1-(your first forum), now that we have this, I need to figure out how I can load the contents for each individual tab. Demo is on my test forum too for now, if you don't want to apply it. Hmmm, so what we have here is you need to load each section manually? Yes, from the method I'm using I load content from /f1- in dl.icon which has the selector '.topictitle'. From what you said, you wanted to load the contents of TEST 1 when its clicked, load contents of TEST 2 when its clicked, and so on.. I'd have to look into this much further. Yes, thank you for that. Hope you find a easier way to load them all automatically.